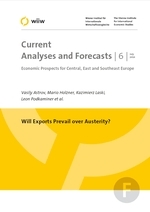 in: Will Exports Prevail over Austerity? Macedonia is hoping for export-led recovery; that should speed up growth to 2% this year and 3 or 4% in the medium term. That scenario, however, seems a touch optimistic. Recovery among the country's main trading partners is going to be slower than previously expected and access to some of the markets, such as Serbia, may prove more difficult owing to loss of competitiveness. Overall, stability has been preserved, but growth remains elusive.